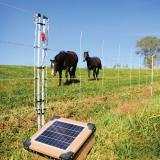 Discontinued — The PRS 100 solar powered electric fence energizer is for folks who need a 1-joule unit for summer through fall usage. When compared to competing units with similar output, PRS units have a larger solar panel (in watts) and larger batteries (ampere hours). 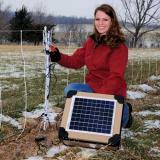 If your fence needs power in the winter, the PRS 100X is the better choice for low-light conditions. 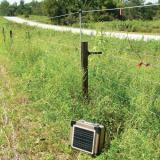 A solar powered electric fence energizer used to keep out deer, raccoons and rabbits from garden/orchard areas. It is also used to keep in poultry, cattle, sheep, goats, horses, and guard dogs. Effective at protecting against coyotes, stray dogs, bear and fox. Requires 3' of ground rod in the ground. Draw from a 12v battery is 87 milliampere (mA) per hour. With this energizer a 12v 100 ampere hour, deep cycle battery will last approximately 28 days* on a clean or a weedy fence. *Assumes being drawn down to 40% between recharges. 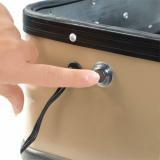 If properly used and or stored, battery should last 3-4 years. 2 miles of 3 strand cattle fence. 3/4 mile of 5-7 strand sheep fence. Assembled in house at Premier. We build each unit and test it before it goes out our door. This allows us to know that we are sending you a unit that works. 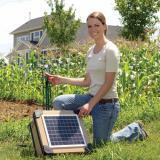 Lowest price for a powerful solar all-in-one 1.0 joule unit. Can be laid flat on the ground during summer months to make them less visible to the public. To catch the sun's power in winter, simply lean it against a post. If you live in low-sun areas, do this in the late fall and early winter also. 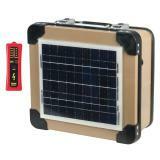 All metal case; very strong and rugged. Won't rust. It's aluminum and stainless steel. 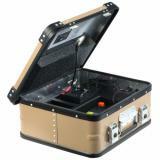 Light brown exterior reduces its visibility to vandals and reduces heat buildup inside the case. All metal clamps for lid. Attach the energizer unit to the battery and it is ready to use. Drive in the ground rod. Lay it on the ground or against a post. 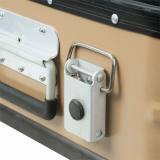 Then attach the earth clip to the ground rod and the fence clip to the fence. Switch it on (when switching on, make sure the button is pressed all the way in). Before the unit goes into storage, fully charge the unit. This will allow the battery to be topped off. 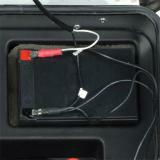 Batteries that are 50% or less charged may become damaged in freezing temperatures. If possible, place the unit in a sunny area, this will allow the solar panel to continuously top-off the battery. The battery will lose charge over time even if the unit is disconnected from the fence and turned off. Face the energizer due South, this will allow the panel to receive the maximum amount of light possible during the low-light days of winter. Instead of laying the unit on its back, stand up or prop up the unit (facing South) to allow it to receive as much light as possible. Hang the unit up (facing South), secure the top and base to prevent the unit from moving. This will keep the unit out of most snow drifts and allow accumulated snow to fall off. If the unit is not to be hung up, clear all debris off the panel, this includes grass clippings, dust (especially on gravel roads), leaves and snow. Do not place in shady areas, this will reduce light intake. Recommended: 58 out of 58 said they would recommend this product to a friend. We use one on our East Farm to electrify the netting that subdivides one of our pastures. Both the sheep and guard dogs respect the charge it sends through the fence. 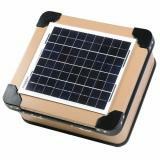 If you experience low light in the winter months (like we do), the solar panel may not be able to charge the batteries as fast as they are depleted. The 100X is better adapted for low light areas. This charger is so easy to carry and set up. It only takes a moment. 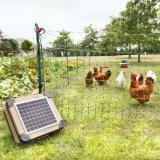 I am using it to protect my poultry as I move them around my property to revitalize a neglected field. Works perfectly! Using in my backyard for a couple goats, and they only had to test it once. It keeps its charge super well, even when I've put it in sub-optimal places/positions. Works as described. I couldn’t be happier with the product. Keeps my flock of sheep exactly where I put them! Jordan B from Packs the power! Works beautifully and took all of 35 minutes to read the instruction manual and set up. 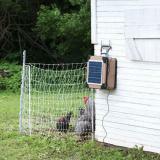 We are using the energizer in conjunction with the 164' poultry net and plan on adding more at a later date. It's currently running between 8,000 and 10,000 volts. We have a heavily wooded property and need to protect our birds from foxes, coyotes, possums and raccoons. Our 150 lb Cane Corsos attempted a sniff and let's just say they won't even look in the direction of the fence now. We can all rest easy at night knowing this energizer is protecting our birds, no question. 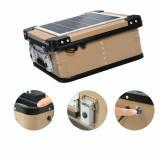 I purchased the PREMIER PRS 100 set (1) solar case includes 2 batteries and a charger, a small wireless hand held tester and 3' ground rod. It was delivered fast (2-3) days. It looks great and comes fully assembled (just need to hook up the + wires to the batteries). I will write another comment once I hook it up to my fence. Thanks for reading and hope this was useful.